I had a few dishes drying in the sink and when I finally got to putting them away I saw something green and did a double take. 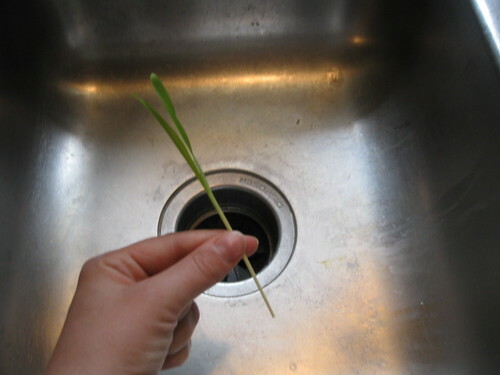 I had six inches of something GROWING out of my sink’s garbage disposal thing. Keep in mind, I never use it or put anything more than occasional water down there. I think those things are stinky and unhygienic and when I finally get my own house will have two proper sinks and not one sink and one incubator of evil. I figured the “soil” down there would be pretty loose so I should be able to pull it and get its roots to transplant (wanted to see what it would grow into y’know) but the stupid thing snapped off. To be honest, I felt violated by the whole thing. First the inconvenient disposal thing, second the plant growing out of it, and third — I was forced to kill it. I hate killing things. Yes, even plants. I like it being a conscious thing and not an accident like this. I felt bad so I thought it would enjoy a nice, wet Florida vacation. I’m hoping that whatever it is it will want to grow new roots. I doubt it but it has been a few days now and it looks pretty comfortable in the glass of water. No roots yet though. Better yet, a crust-less quiche. Julia would not be pleased. Still, some bisquick, four eggs, various cheeses including the ever tasty asiago (pauses for appreciation) and bacon and there is lunch for the next four days. And it was. I sprinkled some asiago on top too. So tasty — and quick too!